To ensure your stay is as relaxed as possible we recommend that you pre-arrange to have your groceries delivered to Sandy Ground. EMail or call Sandy Ground Estates with your arrival information and Nadine will be happy to arrange a water taxi for you. There are a few small grocery stores on Jost Van Dyke but they only have a limited selection. 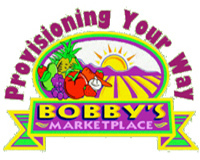 Bobby’s Marketplace on Tortola is the largest supermarket in the BVI and it can supply you with everything you need for your stay. Riteway and Ample Hamper Too also provide provisioning services to make planning your trip easier, simply head to their websites by clicking on any of the logos below to place your order. The easiest way to have your items delivered is to take them with you in a water taxi when you arrive from Tortola. The supermarkets will deliver your groceries to the water taxi pick up location at West End Ferry Terminal, Tortola. Upon arriving at Sandy Ground you will be met by Leeroy who will drive you and your luggage to your villa. Alternatively, you can catch a ferry from Tortola then take a taxi to Sandy Ground, but as there is no access to Sandy Ground by road you will need to carry your groceries and luggage from the road to the Sandy Ground office where Leroy will then drive you to your villa.